Lieutenant Hayes was born at Center Strafford, New Hampshire on September 30, 1907. He was married on September 7, 1941, to Louise MacAllister of Lancaster, New Hampshire who died in 1952. 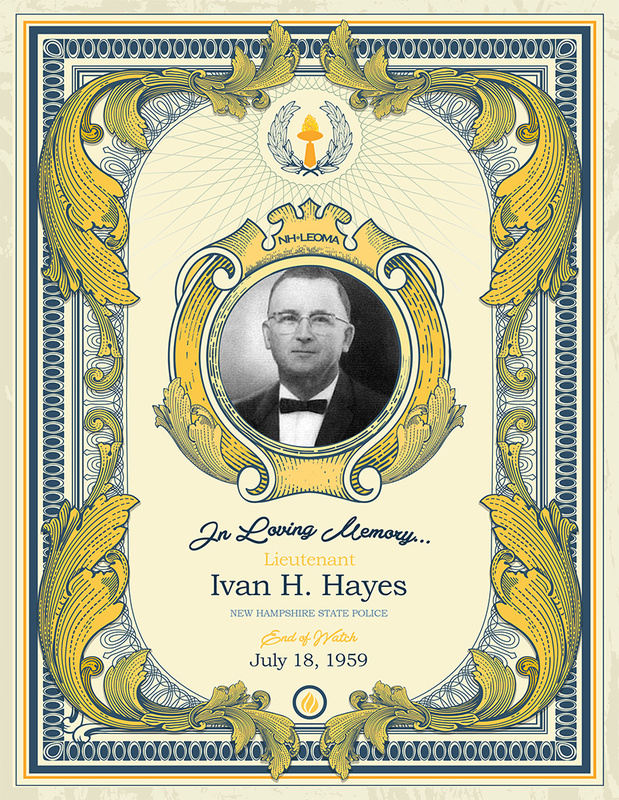 Lieutenant Hayes became a member of the New Hampshire State Police on July 1, 1937, after being transferred from the Attorney General’s Office. He was a graduate of Harvard University Medical Legal School and earned a law degree from LaSalle Extension University. He was also the fingerprint expert for the New Hampshire State Police. On the evening of July 18, 1959, an automobile was reported being wildly driven around the town of Strafford, near where Lieutenant Hayes lived. When he learned that the trooper assigned to the area was busy on duty elsewhere, Lieutenant Hayes offered to try and locate the car until another officer was free. About three hours later a citizen reported that he had come upon the Lieutenant’s car which had run off the road into the bushes. Lieutenant Hayes was inside the car and when another state police trooper arrived at the scene, Lieutenant Hayes was dead, the victim of a heart attack. Lieutenant Hayes left behind his father, Henry, his sister, Irene and two children; Winthrop and Gwen.